We are pleased to announce the launch of Power Manager and Power Manager Pro 4.6.1. This update improves support for macOS 10.12.4 and ends support for older versions of macOS. Power Manager 4.6.1 requires macOS 10.10 or later. 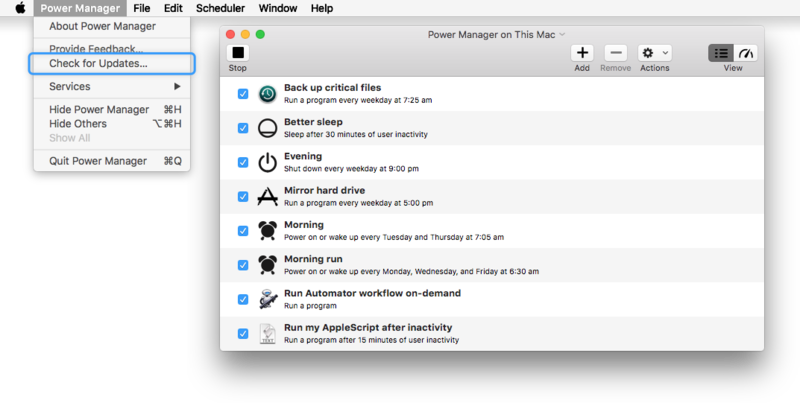 Legacy versions of Power Manager remain available for those running macOS 10.4 – 10.9. However, we recommend updating to a more recent version of macOS. We recommend this because of security improvements made to macOS. New: Added running and not-running example conditions to event editor. Change: Refactored update checking in notification application. Change: Updated administrator guide for Unified Logging. Change: Removed support for macOS 10.7, 10.8, and 10.9; see legacy support. Bug: Fix hardware power scheduling bug affecting macOS 10.12.4. Bug: Fix post-adjustment double event listing affecting macOS 10.12.4.